If you're like me, a lot of little things make you happy, really doesn't take a whole lot! Before we know It February will be over and Spring will be here. I'm sure that those of you that have been buried in Winter are so looking forward to it! Spring is my favorite season. I love everything about it! Now let's see what caught my eye from last weeks party. Rita from Panoply shared two posts on her jadite collection. Both her kitchenware and tableware are amazing! I couldn't pick just one. 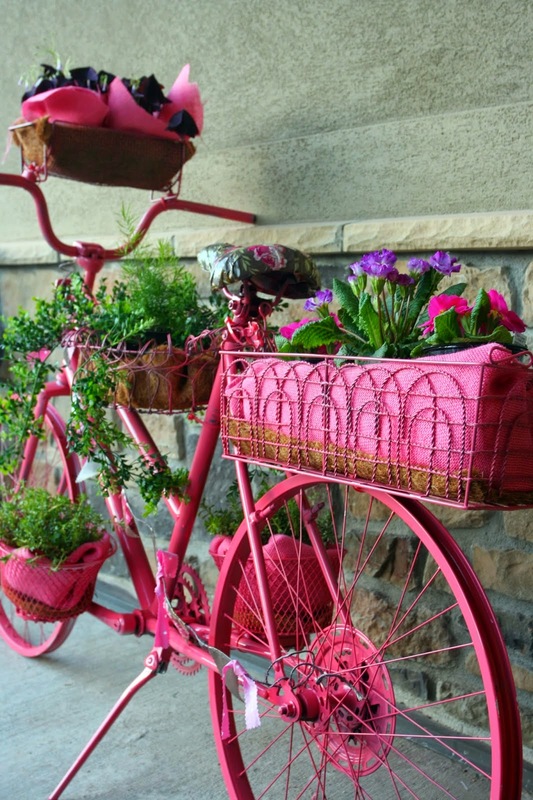 Emily from Adventures of a Busy Bee shared this pretty pink bike all dressed up for Spring! 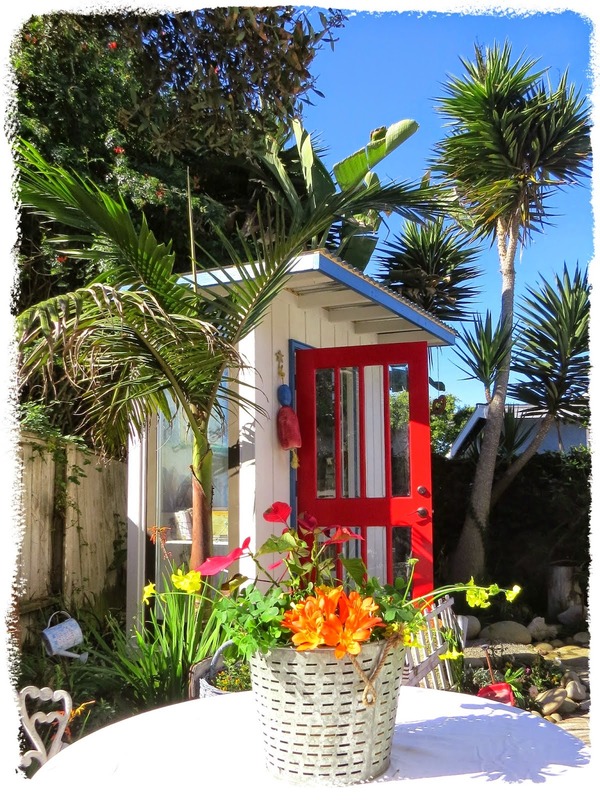 Carol from Art and Sand has built the sweetest little garden house and filled it with so many treasures! 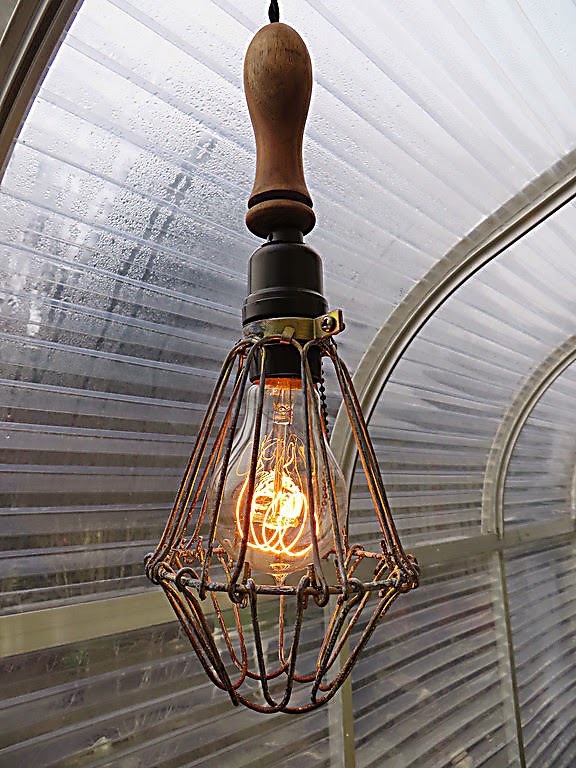 I love these industrial looking lights That Heidi's brother made for her greenhouse. See more at My Sweet Cottage. 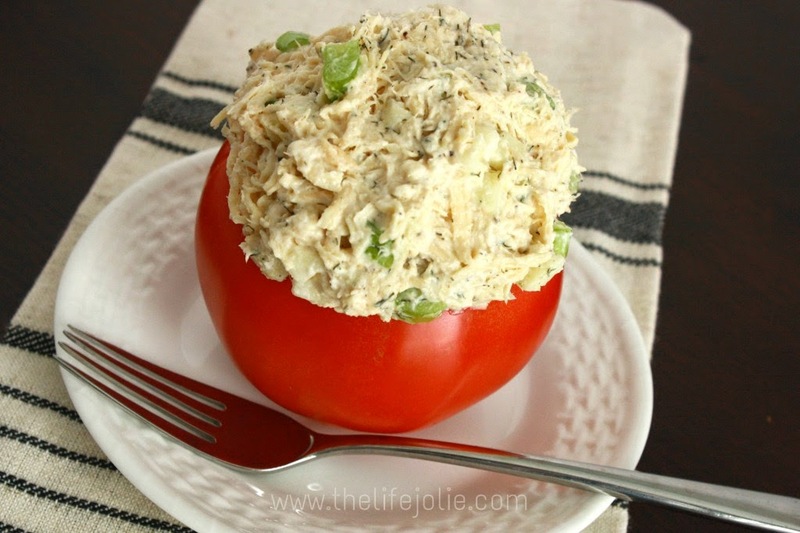 The Life Jolie shared the recipe for this yummy chicken salad stuffed tomato. and see who has been featured there. Wow! What fantastic features! Love that bright colored bicycle planter! Thanks for hosting this fun party! Hope to see you at my Creative Ways Link Party soon too! I love all the features, Jann! Your vintage hardware towel holder is sooo pretty! Thanks so much for hosting. I hope you see my comment,because mine aren't being emailed to bloggers for some reason. Ugh! Great features, Jann. Love Penny's sheep vignette. I am certainly looking forward to Spring. We got over seven feet of snow in February. It may take a while to go but Spring is on its way. Thank you for hosting and enjoy the rest of your week. Jann, Thank you for hosting. Isn't Rita's collection extraordinary. Hi Jann, thanks for the party and hosting each week. That's an impressive jadeite collection and the pink bicycle is adorable. Thanks Jann! That jadeite collection, oh, be still my heart. Loving the pink bike also. Sweet features. I LOVE that pink bike! Thanks for hosting- see you next week. Thanks, Jann. Those features are adorable. 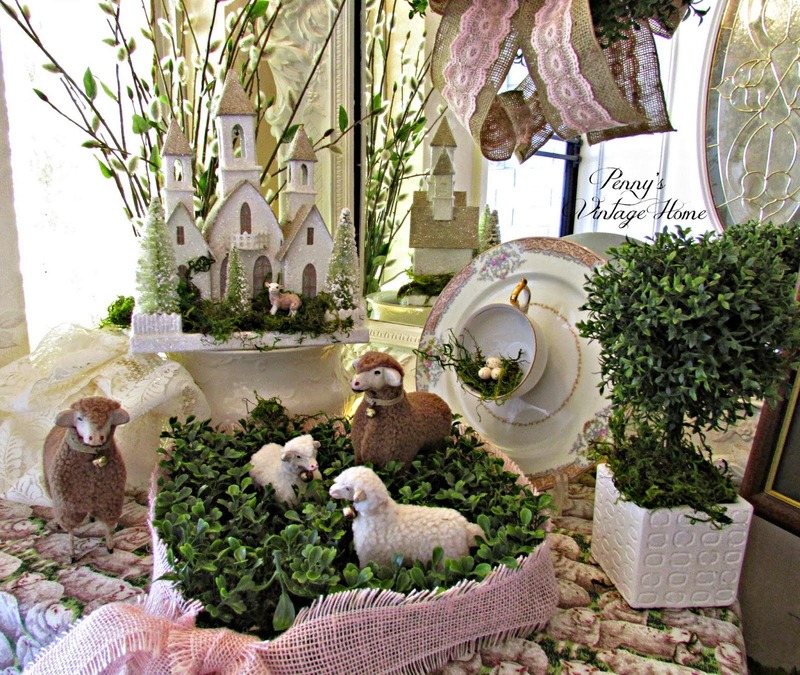 I love the cute vignette with the sheep. Thanks for hosting. Have a great week. Dear Jann, Thanks for another party! I will visit a few posts and see some good ideas and some pretties! 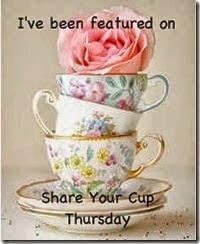 Thanks Jann for Share Your Cup Thursday 138. Love joining in. Have a good week. Jann, thank you so much for featuring my post this week. It's great to be in such good company! Beautiful features, thank you for hosting! Thanks for the party Jann. It's wonderful designs, exquisite pink bike! beautiful photos! Jann, thanks for much for this party! I wonder if Carol from Art and Sand would let me stay in her sweet little garden house so I can warm up! Oh my goodness! - that garden house! Have to run over and see more of it! Good bye! I love that light you featured and that tableware is right up your alley, so pretty! Hi Jann, feels great to be back at the party after being MIA for a few months. Looking forward to mingling with the party goers again and happy to see you are still hosting! Oh my, the features look like SPRING is on its way! Thanks so much for hosting, Jann! Thanks for sharing the party and all the great spring inspirations! I am so ready for spring, even though we have not had nearly the hard winder, so far, that many of my blogging friends have experienced! DEAR JANN - ALL THE TALENT YOU SHARED HERE IS AWESOME. I LOVED THE JADE DISHES TOO. I AM A SUCKER FOR DINNERWARE. HAVE A GREAT WEEK. I'm running late, but wanted to come join in. thanks so much for hosting, Jann! I'm late too...thanks for hosting and I hope you are doing well! Love the features! Great Jadeite collection. Thanks for the lovely party sweet lady. I am sorry I'm so late! Have a lovely and warm weekend ahead. Very fun things you shared this week. I especially like the bike.